With an icing filled bag and a round tip, size #5, draw the alligator on the top of the cake. You can either freehand draw it on the top of the cake or you can use the t-pin transfer method that is described in the birthday cake design tips page. Remember if you choose to freehand it on the top of your cake and you mess up, you can just wipe it away and start again. Cut the cake away from the alligator shape. Save the pieces that you cut away and use them to make the tail of the alligator come around his feet as shown in the picture above. With white icing and star tip, size #18, cover his teeth and the white part of his eye. With red icing and the same size star tip, cover his tongue. Use black icing and star tip, size #18 and cover the inside part of his mouth and pupil of the eye. 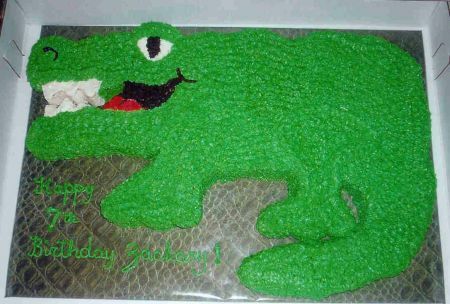 Make a green colored icing and use the same size star tip to cover the rest of the alligator. When you do the eyelid of the alligator, make sure you build it up by making a couple of layers. Use your black icing and round tip, size #5 and make the nostril line and curve of the smile at the end of the mouth. There you have it a very easy to make alligator cake that is sure to be a hit at any alligator themed birthday party.